Yesterday, I attended the Small Business Expo produced by Business First and hosted by Hollywood Casino in Columbus, Ohio. Granted the room was humming with conversation, but the bountiful buffet became the plate on the vast majority of the Exhibitor’s Tables. Sitting and eating at your Exhibit Table/Exhibit Booth are two of the ‘9 Sins of Sabotage’ which defeat the professionalism and effectiveness of your Exhibit Presentation. When is the last time you invited a potential client into your office and as you began your meeting you went and filled a plate with food and sat there and ate while trying to ‘sell’ your prospective client on your services? Hopefully, your answer is NEVER! So, why would you demonstrate such action in public? The word to the wise Exhibitor is….avoid the buffet! You have been asked to represent and market your company via ‘working’ not ‘eating’. Several Exhibitors were doing a great job as they created an engaging exhibit space along with smiling and friendly staff. Hats off to Alexis Caldwell with Experience Columbus, Rocco Giovannucci & Kelly Ratcliff with Jet Container Company, Jess Biller & Nancy Roberts with Paramount Consulting Group and Steve Burkhart with Aurora Exhibit Solutions Inc. I encourage you to continue to remain professional and friendly….as such manners win at the table…every time! Last weekend, I visited the Home Improvement Show in Columbus, Ohio. While 85% of the Exhibit Floor seemed to include the typical “Home Improvement Exhibitors”…I stumbled upon a nice surprise in the back corner….an “Artists Showcase Corner” which included the types of Exhibitors that you would normally see at a Juried Arts Festival along with some other ‘Household Product Vendors.” These Exhibitors were a good fit for the Expo, as ultimately, their products enhance and improve the look or functionally of the Interior or Exterior of Your Home. But, the other notible attribute was that these booths engaged one or more senses…see, hear, taste, touch or smell. Although the area only encompassed about 15% of the Exhibit Floor Space, it had closer to 25% of the Attendee Foot Traffic. So, what does that say…..it is easier to capture attention when your booth is INTERESTING and ENGAGING and involves the senses. This is something that ALL Exhibitors should keep in mind when determining ‘an activity’ to draw attendees into their booth. An activity can be as simple as having the attendee SEE a demonstration, HEAR how a product sounds, TASTE the product via a sampling, TOUCH the item to understand is texture, softness, strength, durability (whatever the selling point is that you want to get across) or SMELL the pleasant aroma. The more opportunities in which you have to engage with an ATTENDEE in your booth….besides just talking with them….the longer they will stay in your booth and enjoy the experience they had in your booth. Both of these positive results will lead to the end-game of selling more on-site or selling to the Attendee in the near future as you made them feel good about visiting your booth. The Home & Garden Show in Columbus Ohio is a 9-Day Show, therefore, is not well-suited for an Exhibitor who cannot maintain stamina and energy for hours on end! 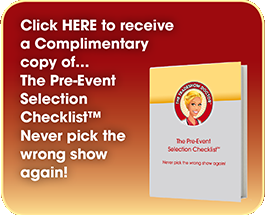 Whenever you commit to exhibit at such a long event, be sure to schedule just as you would for a ‘retail environment’……meaning everyday schedule short 5-6 hour shifts and an overlap of 30 minutes. For example, each Saturday the Show was open from 10am-8pm. So the wise Exhibitor would schedule one person from 9:30am-3:00pm and the second person from 2:30pm-8:30pm, if you cannot afford ‘to staff’ 2 people in the booth at all times. What does this accomplish???? First, arriving 30 minutes early and expecting to say 30 minutes after the doors are locked, allows you to be fully prepared to engage with those attendees who arrive promptly at 10:00am and those who linger past 8:00pm. These attendees are just as important and meaningful as those who come in the middle of the day. For some reason, I observe that this fact gets overlooked by the weary Exhibitor, who runs in at the very last minute or who cannot wait to leave, and forgoes these opportunities to engage! The Best Form of Flattery…..is To Be Copied! Wanted to share a recent experience at The Mid-America Restaurant Expo last weekend. I was AN EXHIBITOR alongside my client, working his booth. It was a 2-Day Expo for those in the Restaurant Industry to Exhibit and the Attendees were typically ‘mom & pop’ restaurant owners with 1-6 locations. With that said, it was a well-attended and well-promoted event! The first day…our neighboring exhibitors did ‘their usual thing’ and watched how we engaged and pulled people into our booth via friendly engagement and a looping video of our amazing service in action. This coupled with our cool promotional products (which everyone loved) created an enjoyable and memorable experience for the Attendees. With that said, on Day 2 the Exhibitor Booth across the aisle from us….had been good students and learned from watching us throughout Day 1. So, on Day 2…..they adjusted their booth layout and brought in a video (which they did NOT have the first day) in order to show the Attendees their flooring process and how they actually do it! The 2nd Day….they were engaging and experiencing more interest and increased interaction, compared to Day 1. The moral of the story…I am glad that they saw ‘The Doctor in Action” and remedied what was missing in their booth…..so in this case, the best form of medicine was to copy what the Doctor was doing!!!! Exhibitor Booths: Hall of Fame or Hall of Shame? As we launch 2017, I do need to set the stage for how I intend to utilize My Blog. 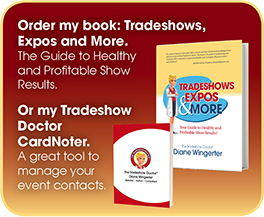 I will be sharing examples of Exhibitor Booth Behavior, which I encounter at Tradeshows, Conferences, Expos, Shows, Fairs & Festivals. The purpose of the Blog is for you….a future exhibitor…to avoid common symptoms of self-sabotage, so as to NOT MAKE THE SAME MISTAKES. You have one chance to make a positive first impression, therefore if the initial impression is not favorable, you are doing more harm than good! Your actions are visible to everyone! There are 6-Steps which encompass every event: Selection, Planning, Preparation, Execution, Follow-Through and Analysis. So, for the purpose of my Blog, I will only assess the “Execution” Step, as that is the step which is taking place during the event. FYI, all 6-Steps are equally important, so if you don’t intend to commit to all the steps, then I say don’t write the check and don’t bother with the event…as it won’t lend itself to a return on your investment of money and time! 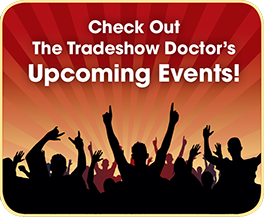 On the flip side, here are 6 Attributes you can perform in your Booth to raise your status and land you in The Tradeshow Doctor’s “Hall of Fame”…..perform all six, and you score a 6 out of 6….you are FANTASTIC & FABULOUS!!! These 6 Attributes include: Smiling, Standing, Engaging in Conversation with the Attendees, Listening to the Attendees, Creating Motion/Action and Providing a Clear Call To Action. Exhibitor: Direct Satellite Service. Initially, they received a 9 of 9 Hall of Shame Ranking, as NO ONE was in the booth. But, about an hour later, when I went by again and observed…..3 Individuals were now “manning the booth” and it didn’t get much better. Their new Hall of Shame Ranking turned into a 5 out of 9. Among the three individuals (which, by the way, is one to many for a 10’x10′ booth) the following was occurring: texting, sitting, eating, co-worker pow-wow & on laptop. They really could have just stayed home! Exhibitor: Central Ohio Fair Housing Association. 9 of 9 Hall of Shame, NO ONE there. Exhibitor: Holdfast Technologies, LLC. Jennifer Hilty is AWESOME and does a wonderful job engaging the public. I have observed her at several Expos and during all instances she lands in my “Hall of Fame” and believe it or not, receives a 7 out of 6!!!! How so???? She is smiling, standing, engaging, listening, moving around the booth, and getting the attendees to take the next step in the sales process. Jennifer receives a bonus point as she is even shaking hands as she meets and wraps up with the attendees. FANTASTIC JOB JENNIFER…..keep it up! 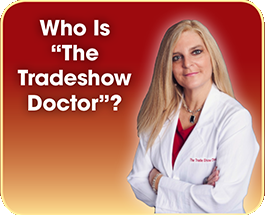 The Tradeshow Doctor is in!